Well, here is another thing to thank our mates across the sea for. British group Minibar has put out Road Movies, an easy-going, excellently crafted pop-rock album that is a perfect match for any moment of any day. 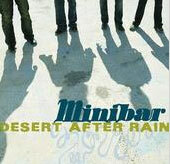 Minibar's laid-back sound is relaxing, but still poignant, creating a favorable aura around the tracks and the band itself. Their just-go-with-the-flow acoustic stylings are perfectly matched to the lyrics, forming a musical presence that is strong and sophisticated. The terrific instrumentation dovetails nicely with the poetic lyrics and personable vocal presence to produce a sound that is simply...friendly. That is what the music on Road Movies makes you feel like — like you are listening not to an album, but to an old friend tell stories that always seem refreshing and genuine. If you can conjure up another album that makes you feel that way, it'll most likely be regarded as a classic by the world over. Starting to see the light yet?